San Luis Obispo is a picturesque town nestled in between rolling hills where cattle graze. Activities are plentiful with beaches, hiking, surfing, craft beer and wine tasting, shopping, spa-ing, cycling, movie theaters, golfing....something for everyone! Located in "Uptown" SLO, you'll be in walking distance of EVERYTHING. Coffee shops, antique shops, restaurants, Cal Poly, The Mission, body spas & salons and downtown shops are all a short jaunt or you can wait at a nearby stop for the trolley to be your personal taxi around our quaint town. This charming California Bungalow is spacious at 900 sq.ft. with a custom remodeled bath and bedroom. Bathroom has a tub and shower and is stocked with spa quality amenities. Bedroom has a handmade Cal King bed frame, comfortable mattress and all cotton bedding for the most comfort! Craftsman style cabinetry provides plenty of storage for any length stay. Stainless refrigerator and dishwasher add modern comforts in this classic kitchen that is fully stocked for all your cooking needs. A stackable washer/dryer is located in the laundry room to make you feel at home on your longer stays. Off street parking is available for a second vehicle. Guests will find the lockbox through the gate on the "driveway side" of the house. We have a spacious gated patio in the front of the house that guest's are welcome to use. There is a back patio where the cars are parked that we prefer to keep private. We live here at the house so may run into you on the property however we tend to let our guests be and encourage them to feel at home during their stay. If you would like to actually visit with us, we are happy to meet you out on the patio for a nice beverage. We live in a very urban part of SLOtown. There is a lot of pedestrian/auto activity as we are surrounded by restaurants, coffee shops, and schools. It's very conveniently located and the neighborhood is alive! We are about a 10-15 minute walk in different directions to the downtown "core", Cal Poly, and the train station. The trolley and bus stops are very near by. The airport is about 10 miles away. If you drive, please be aware that this house is nearly 100 years old and the driveway is very narrow. If you have a larger vehicle or one that is very low, you may prefer to park on the street. There is ONE parking space allowed on the premise. Any additional vehicles please find plenty of free parking on the street. My husband and I have lived in San Luis Obispo for a number of years, building our businesses here and making it our home. We enjoy renovating this 1928 bungalow that we live in and rent out the other half to visiting folks like yourself. We love this area of the Central Coast for it's simpleness, quiet scenery and magnificent coastline. For being such a small town, I am ever amazed at how many things there are to do around here! We fell in love with this house for many reasons... classic design, sturdy construction, location! Being in the business of home design and construction, my husband and I saw the potential in this house. Code words for fixer upper! We have and continue to renovate it to our own liking, enhancing the craftsman/spanish style while adding the modern conveniences that make it a joy to live in. The Monterey Street House is clean, classic and comfortable for your stay here in San Luis Obispo. Again, the location can not be beat for easy walking/biking access to Cal Poly, Downtown SLO, and freeway access. The living room has a queen size futon couch. It is located at the opposite end of the house so there is privacy between the bedroom and living room. Great place and a fantastic location. Walking distance to all of downtown. Great location and nice touches like robes and a basket with goodies. We stayed while dropping our Daughter off at Cal Poly. Couldn’t have asked for a better location. Close to campus and close to downtown. You can walk to both. Overall, this is great spot to stay. Very cute place in a great location! We had a great stay at the Classic California Bungalow. The duplex came clean with all the amenities listed. It is conveniently located next to several restaurants and cafes. We also loved how it was walkable to the heart of downtown SLO. Juli and Andrew were very responsive with any questions we had and were excellent hosts! 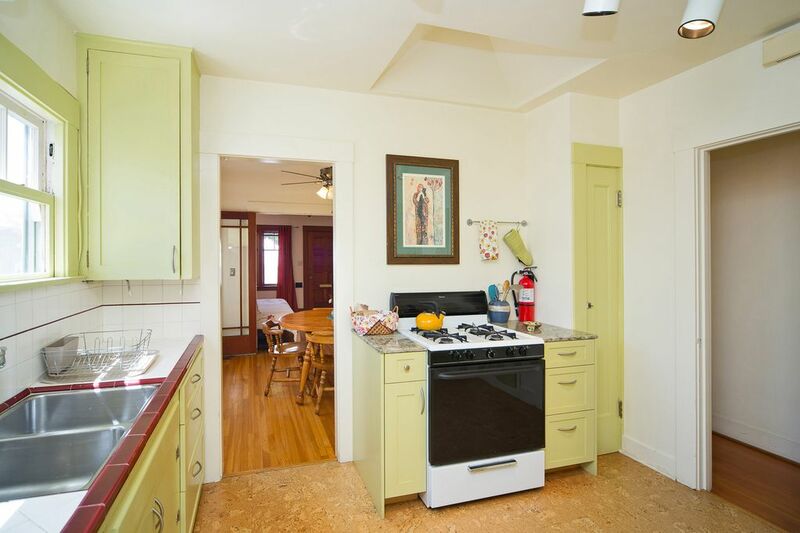 We fell in love with this early 1900s bungalow and all its charm and beauty and impressive renovations. It seems much more spacious than the pictures show. The bed and futon were extremely comfortable. We came down for a girls weekend with my friend, my daughter and her friend. The younger girls shared the futon and with the living room having french doors you can close they basically had a great room to themselves. The whole place was very clean and updated. Sitting on the front patio was our favorite spot. And we loved having off street parking. It is definitely walking distance to downtown which was great. We will request this stay every time we visit SLO in the future! The bungalow was ideal - clean, cozy, bright. It retains much of the character of an older house, but is updated with modern conveniences.The outside patio is a perfect place to hang out, read, have a drink. Thoughtful touches throughout. And—this is important—a really comfortable mattress and sheets. Easy walk to downtown. Many restaurants, brewpubs, & coffee shops within a few minutes walk. We really didn't need a car, except to go to the beach, which is 15 minutes away. San Luis Obispo has a lot to offer for such a small town. We have a lot of visitors for the Cal Poly University that is right up the street from this rental, definitely in walking distance. Downtown SLO has one of the biggest farmer's markets in the US every Thursday night. There is a trolley pick up right across the street that will take you right into the heart of Downtown and bring you back. The mission is an active church open to the public with a small museum that is must see for California history. SLO also has a very cool Children's Museum that will entertain any little ones for hours, as well as their parents. Of course there are lots of cute boutiques and restaurants to enjoy. We are down the road from Paso Robles wine country where there are tours galore! Please inquire about tour buses that will pick you up here and bring you back for worry free wine tasting! We also are very close to the ocean. Avila and Pismo Beach are about a 15 minute drive on the 101 South. Morro Bay and Cayucos are equal distance from here on Hwy 1 North.